February, March, and April were difficult months for us. I was on the Gulf coast of Florida basking in the sun and Chris kept having to fly out to Houston for job interviews and pre-employment testing. He was gone more than he was home during those months. We didn't know he had the job for sure until exactly two weeks before his start date. And he wouldn't be given time to fly back and help move! That left it up to me to pack up everything and drive our 34 foot motorhome, Jeep, and 16 foot boat back to Texas by myself. Quite a daunting task! Thank goodness, Daddy came to the rescue. My Dad flew from west Texas to Florida on a few day's notice to help me move. Add to Dad's plate that he had just had a knee surgery a couple days before! He's a trooper. Considering that the motorhome doesn't have cruise control but the Jeep does, I asked Dad to drive the Jeep and tow the boat while I drove the motorhome. We traveled about 250 miles a day. The first day we never got out of Florida. Oh, how I hated stopping for gas! On the first stop for gas, I got too close to the pump and was scared to pull out. Dad took over to get the motorhome away from the pump. When he got to the edge of the road we put it in Park to switch drivers (okay I leaned over Dad to put it in Park). Dad stood up and stepped away from the wheel. Suddenly I realized the motorhome was rolling into a busy street! Oh no! I jumped into the seat and stood on the brake pedal. Oops. Must not have gotten the shifter all the way into the Park setting. Pesky gears. Don't worry, no one hit us and we got back on the road with just a little case of the shakes. We stuck to the interstate like glue, exiting only at rest stops or to fill up the gas tanks. I made it across the narrow bridges in Florida. I made it through the underground tunnel in Alabama. Just across the Mississippi state line, we noticed a break on the boat trailer and found a welding shop. The welding shop looked at it and said, "You don't need a weld, you need a new trailer!" Oh, if only we'd listened. Instead we paid for a patch and prayed for the trailer to make it to Texas. Onward! We crossed Mississippi and over into Louisiana. The next obstacles were the 40 mile long Breaux Bridge and then Baton Rouge which always has horrible traffic and then there's a steep bridge upon which the motorhome refuses to go more than 45 miles an hour. Whew! Got through those, piece of cake. We were now in the home stretch. We've been sleeping at rest stops, dry camping, skimping on water so no baths, and there are dents in the steering wheel from my fingerprints. Did I mention that one morning the motorhome didn't want to start and we had to go pump the fuel by hand? That's okay, we got it started after a half hour of me crying and Dad reassuring me that this too, shall pass. In Shreveport, LA my Dad called me on the cellphone. 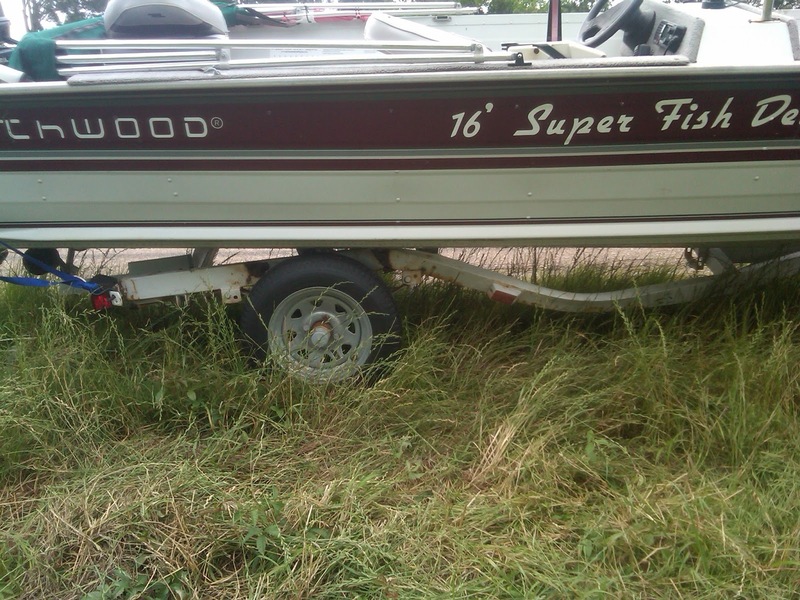 He said the boat trailer had broken completely and there would be no patching it this time. He was on the side of the road a couple exits behind me. I took the next exit and found a very conveniently large parking lot to pull the monster into. 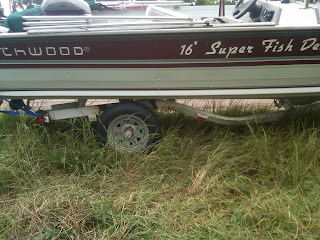 Dad detached the boat trailer from the Jeep and came to pick me up so I could see the damage. When we drove up, we saw shrapnel from the trailer was strewn across the road for a mile behind him! 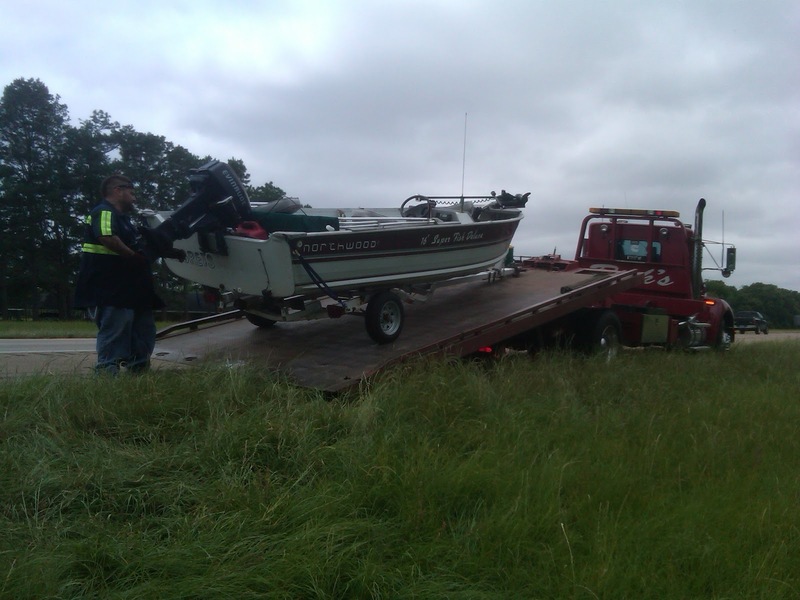 Somehow the boat was still on the trailer and intact. Ohmmy!! I don't know if I could drive the fiver...If I did, I am sure everyone would have to get out of my way...What a harrowing experience you had...Thank God for Dads! Melissa, truly you are gifted at all you do. Your writing and pics are the best...and I could kick anyone who could not see you were and are the best ranger ever. Gifted?...why you ARE a gift. Thanks for writing a blog, and I hope we meet again one day...as those adventures just keep coming, don't they? Public open houses & brokers tours new homes for sale in McAllen TX, lawn signage, as well as property feature page; nearby newspaper advertisements; telemarketer system; and customized property marketing. I will remain in constant conversation with you and give you progress reviews on showings and all activity. Dr Jayaswal, DMD tooth colored teeth fillings work excellent to fix most of the tooth decay. They can fit within normally with the rest of your teeth, and once the actual filling up is positioned a person won’t have any trouble biting down hard or eating. A filling may also be used to exchange chipped or broken teeth, in order to close a little space in between tooth.